BOSTON, MA | Public media leader WGBH Boston, in partnership with EDC, will create new initiatives to help kids ages three to five gain science and computational thinking skills, thanks to funding from the National Science Foundation. This support will help continue WGBH’s commitment to enriching and educating kids and EDC’s mission to improve education, health, and economic opportunity worldwide. 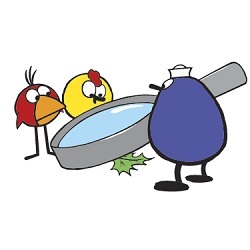 Bringing Science Home with PEEP will leverage the popularity and success of the NSF-funded, Emmy®-Award winning TV and digital series PEEP and the Big Wide World/El Mundo Divertido de PEEP to engage both parents and preschool children with science. Monkeying Around is WGBH’s newest preschool STEM initiative. Featuring an entertaining cast of monkeys—Maisie, Daisy, Fred, and Bo—Monkeying Around will capitalize on the power of story, appealing characters, and relatable storylines to teach computational thinking to preschoolers through an animated television series, website, apps, and hands-on activities.